2. The Commander Task Force along with the Commanding Officers of the two Royal Saudi Arabian Navy ships calling on Vice Admiral JS Bedi at the Headquarters of the Western Naval Command, Mumbai. Two ships of the Royal Saudi Arabian Navy (RSAN) HMS Al Damman & HMS Yanbu arrived at Mumbai port today on a 4-day routine visit. 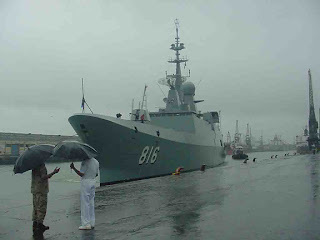 This is the maiden visit to Indian port by warships of the Royal Saudi Arabian Navy. HMS Al Dammamis a Frigate with a crew of about 165 under the command of Capt Bandar Wasal while HMS yanbu is a logistics support ship under Capt Hasan Soufyani. On arrival at Indira Dock the ships were received by Senior naval officers of the Western Naval Command. The Navy band was in attendance. Captain Dhafer G Alamir, Commander Task Force, along with the Commanding Officers of the two ships called on Vice Admiral JS Bedi, Flag Officer Commanding-in-Chief, at the Headquarters of the Western Naval Command. During the ships stay in harbour, there will be an exchange of visits to ships by officers and sailors of the two Navies, besides social interaction and friendly sports fixtures. These ships also have about 75 cadets of the Naval College embarked onboard. Ships are scheduled to depart Mumbai on 01 Aug.